Aesthetic Design & Build is offering louvered roofs to St. Louis and St. Charles county. The opening louvered roof is an innovative solution for residential and commercial outdoor living spaces. 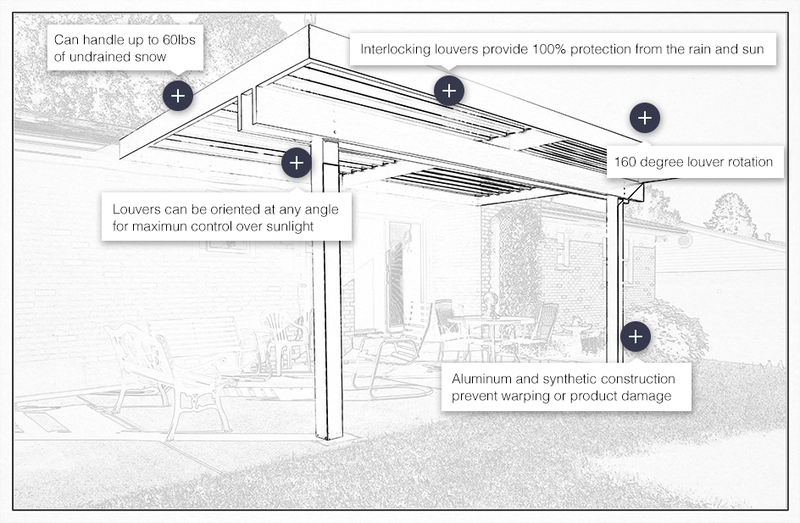 These unique systems offer protection from the rain, while allowing the flexibility of adjustable amounts of shade and light. Louvered roofs are fully motorized and remote control operated, and are constructed from high quality aluminum and synthetics. Outfitted with self-lubricating hardware and quiet, smooth operation, our louvered roofs are easily able to incorporate ceiling fans and lighting. Aesthetic Design & Build is the exclusive St. Louis supplier of Apollo Opening Roof Systems, designed and constructed in the USA. The product specifications of Apollo louvered roofs are listed below. An Aesthetic Design & Build louvered roof is the perfect addition to any outdoor area including patios, decks, pool areas, and outdoor dining and entertaining spaces. If you think that a louvered roof is the outdoor solution for you, contact us or call 636-532-5008 today!